These tubes can even fit a spring Snake! Hi Tommy- At my advancing age I have purchased very little magic these past few years. That being said, I bought your SWITCH TUBE to use instead of a change bag as you suggested. It arrived today - Please know I am very pleased with it, quality wise, appearance, ease of use etc. of excellent quality, and audience tested. Thanks for the speedy service on a product that is going into my show immediately. A refreshing new utility device for switching silks and other objects! 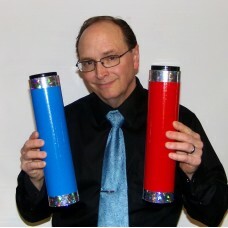 "Tommy's new Magic Switch Tube is a utility item that every kid-show and family performer should own. It allows you to do change bag effects without a change bag. Simple, effective and recommended!" We all use silk effects in our act. 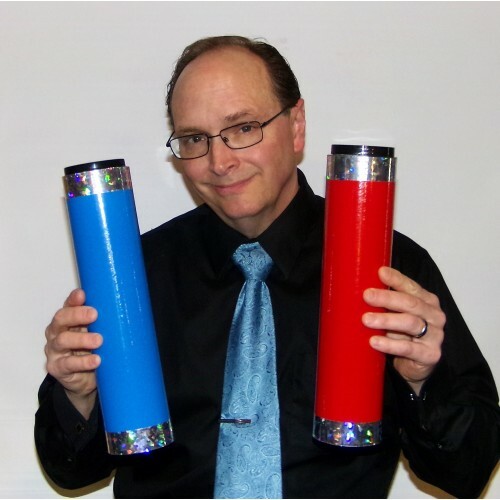 This new switching device was inspired and works like the classic Niffen Tube, the only difference, this new tube will hold a large amount of silks which is a well-needed prop for many performers using the very outdated change bag. The uses for this tube are limited by your imagination. Coloring routines: Place colored silks into the tube. Have a child helper "remove" the colors and place them into your favorite coloring routine such as the coloring book, magic painting effects etc. When you remove the silks, they are now all white! The colors have been removed. Snake can routines: Need I say more? Silk tying effects: Place individual silks into the tube, when they come out, they are tied together in a chain. Blendo effects and mis-made silk effects can all be accomplished with this switching device. Tommy even uses this for his giant mis-made flag effect using the large 18" X 24" silk flag set. Totally easy to use! Complete with a four page spread of instructions with handling tips, suggested routines as well as Tommy sharing his entire sequence and handling of his own mis-made flag routine. The tube measures 13" tall and 3" in diameter. Each chamber will easily hold twelve 18" silks. Colorful, lightweight and a prop you will be proud to own!